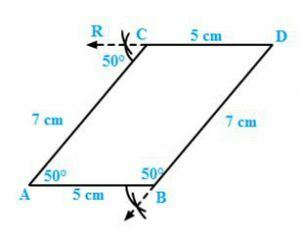 Draw angle BAC = 50° such that AB = 5 cm and AC = 7 cm. Alternate angles are equal; therefore the line is parallel to AB. 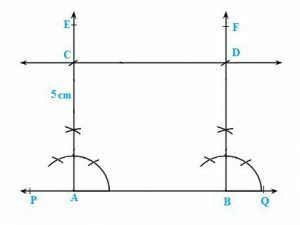 Again through B, cut an arc at an angle of 50° and draw a line passing through B and this arc and say this intersects the line drawn parallel to AB at D.
Also we can measure BD = 7 cm and CD = 5 cm. Draw a line PQ. Draw another line parallel to PQ at a distance of 3 cm from it. Take any two points A and B on the line. With A as centre and radius 3 cm cut AE at C.
With B as centre and radius 3 cm cut BF at D.
Join CD and produce it on either side to get the required line parallel to AB and at a distance of 5 cm from it. Take any three non-collinear points A, B, C and draw ∠ABC. Through each vertex of the triangle, draw a line parallel to the opposite side. Mark three non collinear points A, B and C such that none of them lie on the same line. 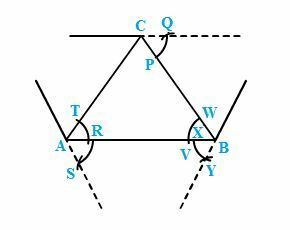 Join AB, BC and CA to form triangle ABC. With A as centre, draw an arc cutting AC and AB at T and U, respectively. With centre B and the same radius as in the previous step, draw an arc on the opposite side of AB to cut AB at X. With centre X and radius equal to TU, draw an arc cutting the arc drawn in the previous step at Y. Join BY and produce in both directions to obtain the line parallel to AC. 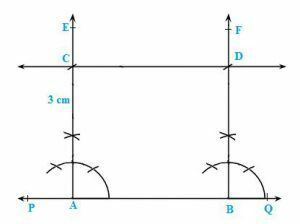 With B as centre, draw an arc cutting BC and BA at W and V, respectively. With centre C and the same radius as in the previous step, draw an arc on the opposite side of BC to cut BC at P.
With centre P and radius equal to WV, draw an arc cutting the arc drawn in the previous step at Q. Join CQ and produce in both directions to obtain the line parallel to AB. With B as centre, draw an arc cutting BC and BA at W and V, respectively (already drawn). With centre A and the same radius as in the previous step, draw an arc on the opposite side of AB to cut AB at R.
With centre R and radius equal to WV, draw an arc cutting the arc drawn in the previous step at S.
Join AS and produce in both directions to obtain the line parallel to BC. Draw two parallel lines at a distance of 5kms apart. With A as centre and radius 5 cm cut AE at C.
With B as centre and radius 5 cm cut BF at D.